IsoSciences has provided our customers with continuous improvement and top quality products and services for over 25 years. IsoSciences is committed to quality at every level of the business and sustains a rigorous, comprehensive, modern quality system that incorporates quality with vigorous continuous improvement. Our expert teams are talented and experienced with a high commitment to quality. We build on that through adherence to qualified processes that ensure quality at every step in the process with traceability of all documentation and materials used, equipment utilized and work performed, and our comprehensive Certificate of Analysis. IsoSciences quality credentials include accreditations for ISO 9001:2015. 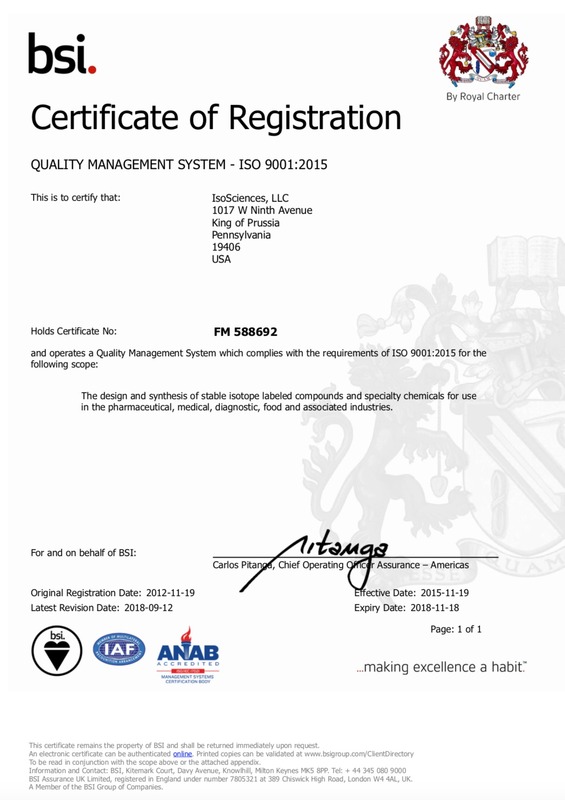 Download our ISO 9001:2015 certificate here.